Round post with decorative scrolls. Made from steel with a rust-resistant powder coated finish. Designed for in-ground installation with concrete. Recommended with standard size mailboxes. Size: 52.1"H x 6"W x 10.7"D. Smooth rust resistant galvanized steel mailbox comes fully assembled with steel latch and aluminum flag. Medium capacity is standard in most households and can hold letters, magazines, padded mailers and small boxes. Size: 8.9"H x 6.9"W 20.1"D. Smooth rust resistant galvanized steel mailbox comes fully assembled with steel latch and aluminum flag. Medium capacity is standard in most households and can hold letters, magazines, padded mailers and small boxes. Size: 8.9"H x 6.9"W 20.1"D.
Rustproof polypropylene plastic resists impacts and all types of weather while providing outstanding service. The mailbox body incorporates a ribbed design on top and textured side panels. Medium size holds magazines, padded mailers and small boxes. Comes fully assembled. Size: 9.8" H x 7.9" W x 20.4" D. Classic large, rural mailbox comes fully assembled with steel latch and aluminum flag. Large capacity can hold several pieces of mail and small parcel. Smooth rust resistant powder coat finish. Size: 10.9"H x 8.7"W x 22.6"D. Flap and back plate included. Size: 10"W.
Classic large, rural mailbox comes fully assembled with steel latch and aluminum flag. Large capacity can hold several pieces of mail and small parcel. Smooth rust resistant powder coat finish. Size: 10.9"H x 8.7"W x 22.6"D. Classic large, rural mailbox comes fully assembled with steel latch and aluminum flag. Large capacity can hold several pieces of mail and small parcel. Smooth rust resistant powder coat finish. 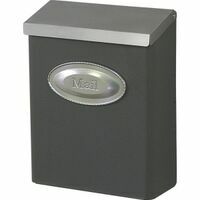 Size: 10.9"H x 8.7"W x 22.6"D. Lockable wall mount mailbox constructed from rust-resistant galvanized steel and has a durable powder coat finish. For security this mailbox has a concealed cam lock and comes with two keys. Its medium capacity can hold magazines and large envelopes. Optional decorative emblem included. Size: 12.6" H x 9.7" W x 4.4" D. Mounting hardware sold separately. Gibraltar Security Mailbox, Lockable, Series: Designer, 9-5/8 in Width, 4-3/8 in Depth, 12-1/2 in Height, Wall Mounting, Concealed Cam Locking, Galvanized Steel, Venetian Bronze, Includes: (2) Keys, For used to hold wide pieces of mail, such as magazines Medium wall mount mailbox is constructed of heavy-duty galvanized steel with a textured finish. Fully assembled. Mounting hardware sold separately. 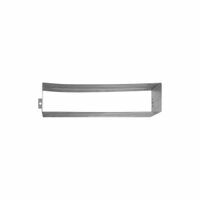 Size: 9.8" H x 16.6" W x 4.5" D. Spring loaded front plate, standard back plate. Opening: 11"W x 2"H. Weather-Tite construction featuring interlocking flap and frame. Spring loaded front plate, insures tightly closed position. Overall size: 13" W x 3-9/16"H.